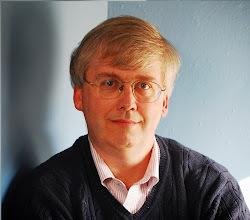 CONVERSABLE ECONOMIST: Who Sings Homework Blues? I have three children between grades 6 and 10, and I view homework as a plague upon the land. Family time is tight. The hours between dinner and bedtime are few. Weekends are often full of activities. It can feel as if homework overshadows and steals any available down-time and flexibility. That said, I have to admit that the evidence about actual amounts of homework tends to suggest that it's not a problem for most families or students. Instead, my suspicion is that too much homework is a problem for one group and too little homework may be the problem for another group. There's a nice summary of the evidence on "Homework in America" by Tom Loveless in Chapter 2 of the 2014 Brown Center Report on American Education:How Well Are American Students Learning?" As Loveless points out, controversies over "too much homework" have been going on for a long time. "In 1900, Edward Bok, editor of the Ladies Home Journal, published an impassioned article, “A National Crime at the Feet of Parents,” accusing homework of destroying American youth. . . .Bok argued that study at home interfered with children’s natural inclination towards play and free movement, threatened children’s physical and mental health, and usurped the right of parents to decide activities in the home. The Journal was an influential magazine, especially with parents. An anti-homework campaign burst forth that grew into a national crusade. School districts across the land passed restrictions on homework, culminating in a 1901 statewide prohibition of homework in California for any student under the age of 15 . . ."
Among more recent examples in the last 10-15 years, Loveless points to cover stories on the "too much homework" theme in TIME, Newsweek, and People, the documentary movie Race to Nowhere, and a September 2013 story in the Atlantic, "My Daughter's Homework is Killing Me." But of course, it's an old saying among social scientists that the plural of anecdote is not data. The systematic data suggests that the homework burden is not a widespread or growing problem. For example, one of the standard national surveys is the National Assessment of Educational Progress (NAEP). Here are their results from surveying students about how much homework they had the night before. As you can see, there is a small share of students who report more than 2 hours of homework per night, but that share doesn't seem to be growing over time. 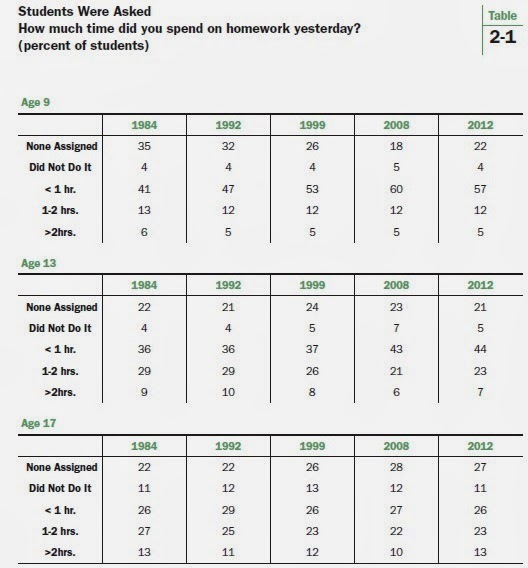 And among 17 year-olds, 27% had no homework assigned the night before the survey. Of course, one might wonder about just how this survey was carried out, but Loveless runs through a number of other surveys of parents and students that reach similar results. As one more example, here's a survey of college freshmen--thus only a sample of those who went on to college--about how much homework they had done as high school seniors. About two-thirds report have done less than 6 hours per week, which of course averages less than an hour per day. So how do the homework-haters, like me, chew and swallow this evidence? 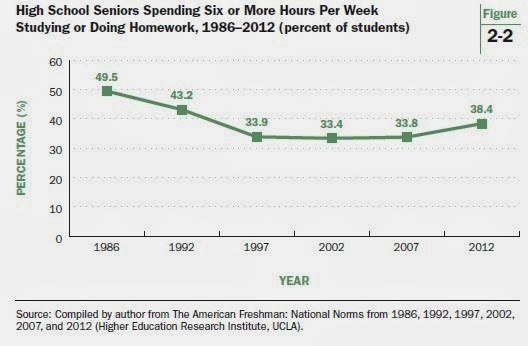 The evidence is very clear that most students don't have too much homework. But it certainly leaves open the possibility that some high school and even middle-school students, perhaps 10-15%, average more than 2 hours of homework each night. My guess is that a lot of these students are also active in school activities: clubs, sports, plays. By the time you add their regular school day, they are in effect committed to one activity or another for about 12 hours out of every day, which doesn't leave a lot of time for eating, commuting, sleeping, and anything else. "There’s never a time to rest. There’s always something more you should be doing. If I go to bed before 1:30 I feel like I’m slacking off, or just screwing myself over for an even later night later in the week . . . There’s never a break. Never." In some cases, it feels to me as if parents want the school to push their children to achieve, and schools are responding with a blizzard of homework, while students are caught in the middle. The obvious answer here is for parents to push back, hard, at the individual schools where this happens. But at the other end of the academic achievement scale, America's difficulties with low graduation rates in many high schools, and the need to raise academic achievement across the board for social mobility, active citizenship, and economic growth, suggests that many students are not getting sufficient homework--which is to say that many are getting none at all, or none that they ever do. Finally, I'll add that the way in which a school day interacts with the modern family is part of the issue here. Fewer households with children have a stay-at-home parent waiting with milk-and-cookies at 2:30 or 3. Children get signed up for afternoon activities in part to provide coverage through the work-day of the parents. By the time the parents and children get home, everyone has had a long day already. At that point in the day, starting at 7 or 8, even a moderate amount of homework feels like a heavy load, and 2 hours or more can feel crushing. Personally, I'd love to see schools experiment with a schedule where most of the the children would be there from 8-5. (Parents who want to pick their children up at 2:30 or 3 could do so.) But when the child came home at 5, they would be typically be done with homework for the day. Optional activities like sports or music could still be in the evenings, as desired. Or I'd like to see schools experiment with a rule that all homework is due Wednesday, Thursday, and Friday, but under no circumstances ever due on Monday or Tuesday, thus trying to save the weekend. I know family life will always be busy, and I wouldn't have it any other way. But the ebb and flow of even moderate levels of homework across multiple students isn't just a student burden. It takes a toll on families, too.